Give Me My Remote > Who is the Deer on Masked Singer? Comments Off on THE MASKED SINGER: Who Was Unmasked? 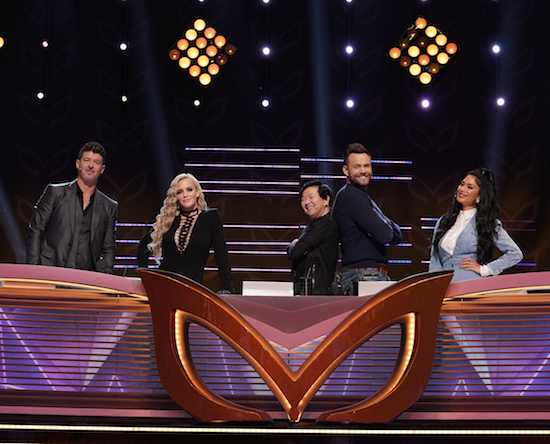 THE MASKED SINGER: L-R: Panelists: Robin Thicke, Jenny McCarthy, Ken Jeong, guest panelist Joe McHale and panelist Nicole Scherzinger in the all-new “Five Masks No More” episode of THE MASKED SINGER airing Wednesday, Jan. 16 (9:00-10:00 PM ET/PT) on FOX. © 2019 FOX Broadcasting. CR: Michael Becker / FOX. Tags: Masked Singer Terry Bradshaw, The Masked Singer, the Masked singer episode airing January 16, the Masked singer episode airing Wednesday January 16, The Masked Singer spoilers, Who is the Deer on Masked Singer?